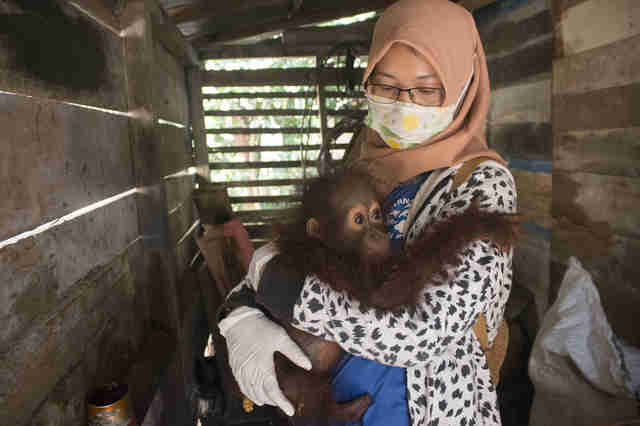 No one could believe where Uka, a 2-year-old orangutan, had been living for the past several months. 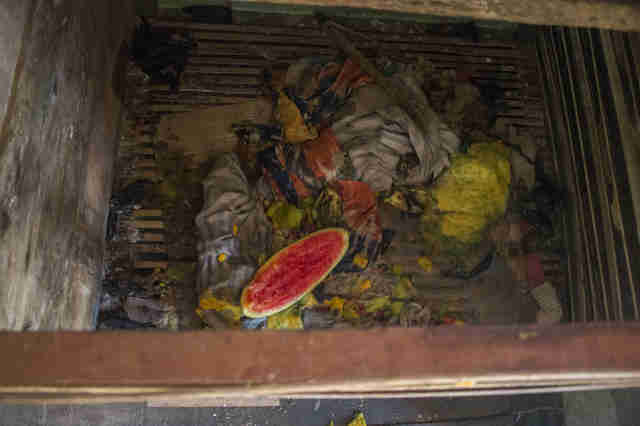 Rescuers from International Animal Rescue (IAR) and forestry department officials peered into a tiny wooden cage, which was only about 10 square feet, and found the orangutan standing on a putrid bed of rotten fruit, feces and urine-soaked rags. 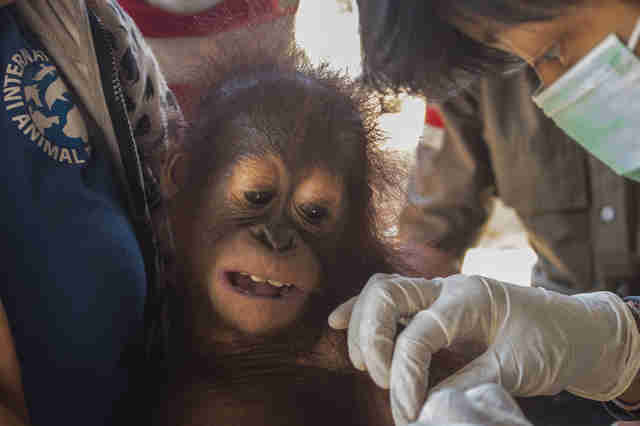 The tiny orangutan had a runny nose and watery eyes, and he was even struggling to breathe. The rescue team knew they had to get him out of there as quickly as possible, or else he might die. Uka was being kept on the property of a man named Jalim, who claimed to find Uka all alone in an industrial tree plantation in West Borneo, Indonesia. He took Uka home to keep him as a “pet,” feeding him fruit and condensed milk. While certain fruits are part of an orangutan’s natural diet, along with leaves, bark, flowers, honey, insects, vines and shoots, condensed milk is definitely not something he should have been eating. Uka, who seemed to be suffering from a flu virus, which he probably caught from people, was listless and subdued. 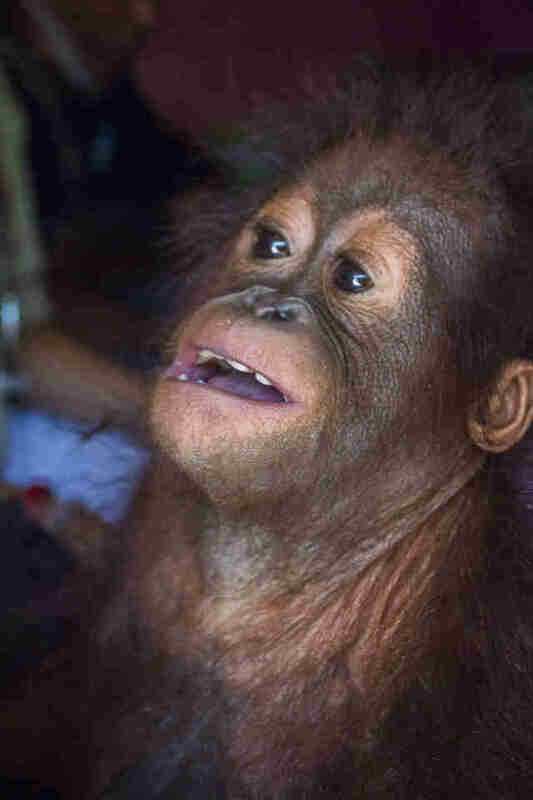 But when an IAR vet named Elisabeth lifted him out of the cage, Uka seemed to relax. “In the wild, he would still be clinging to his mother, and so being in Elisabeth’s arms must have been comforting to him after the time he spent in that dark filthy crate,” Key said. Sadly, Uka’s situation is far from unusual. Borneo orangutans like Uka are losing their homes when people cut down the forest to build palm oil plantations. With no place to go and nothing to eat, orangutans often wander into the plantations to look for food, and angry farmers take to shooting them. 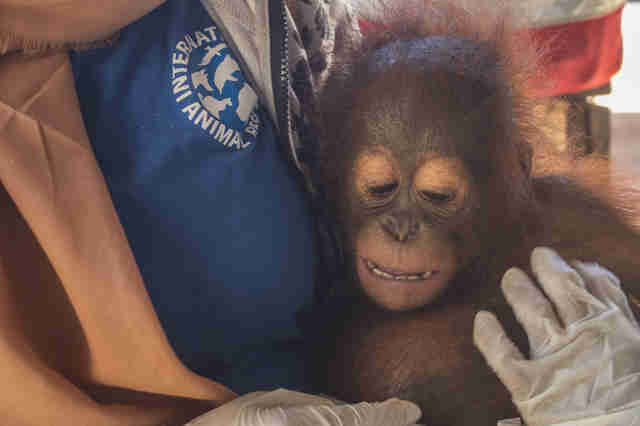 When an individual claims to have “found” a baby orangutan, there’s usually more to the story than this. In the wild, orangutan moms would never abandon their babies, and the only way people could take a baby — so they can keep the animal as a “pet” — is to kill the mother. Not only that, but babies often watch their mothers being killed right in front of them, leaving them psychologically scarred. While it’s not entirely clear what Uka went through, he was in pretty bad condition. The rescue team’s biggest concern was the flu symptoms he was exhibiting. Despite everything he may have gone through, the IAR team is going to make sure things get better for Uka. 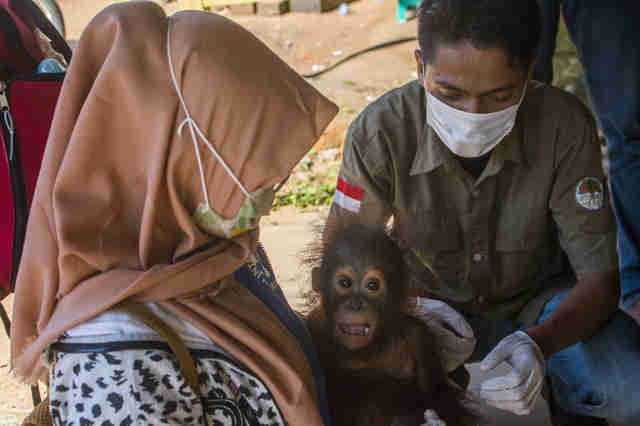 After giving Uka rehydration fluids and a general veterinary check, the rescue team decided he was well enough to travel to IAR’s rescue center in Ketapang. 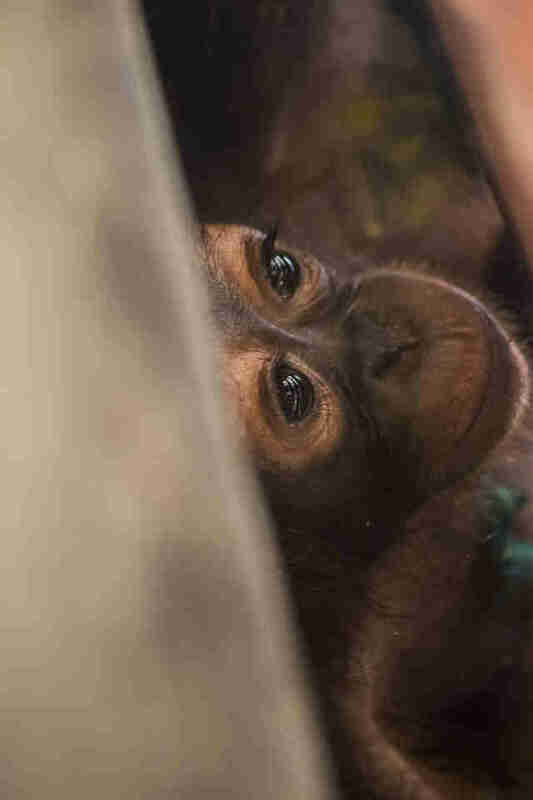 For now, Uka will be kept in isolation at the rescue center so the vets can monitor his health, and to make sure he doesn’t have any illnesses that could spread to others. But once he’s better, he’ll be able to start making friends. To help Uka get strong and healthy, and to help other orangutans like him, you can make a donation to IAR.